The research group Spatial Research in Environment, Agriculture and Health aims to gather Spatial Sciences expertise into a research group capable of delivering applied innovative research involving GIS, Remote Sensing and Geostatistics. The research group works on cooperation with other researchers by proposing and developing new approaches that use spatial data to improve analysis and modelling, utilising existing spatial data acquisition equipment. 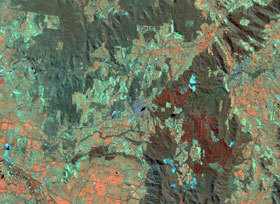 Spatial health data analysis and environmental monitoring. Horta, Whitsed et al. (2015-ongoing). This project will gather health data considered relevant for the Murrumbidgee region (in terms of incidence and mortality) and will use visualization and statistical techniques for spatial pattern analysis. Additionally, environmental information will be collected and combined with health patterns to ascertain possible correlations that will help health and government agencies to improve their assessments. Soil National Database for International Year of the Soils. Horta (in cooperation with the Technical University of Lisbon, Portugal) (2015) The first Portuguese soil database is going to be published in the context of the International Year of Soils (2015). 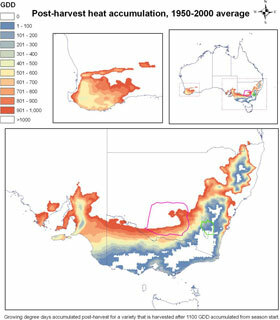 Additionally, spatial modelling techniques will be used to produce national soil properties maps. Cellular Automata modelling. Whitsed and Smallbone (2012-ongoing). A cellular automata model is spatial modelling technique that can be applied to modelling vegetation change. Dr Whitsed and Dr Smallbone currently have two publications on uncertainty in a cellular automata for vegetation change, with further publications in progress. Spatiotemporal variability in vineyard phenology. Hall (with partners in Australia and USA) (ongoing) Several externally funded projects have led to significant research outputs on the topic of vineyard phenology, specifically, the effect of soil and topographical variability on within vineyard performance (precision viticulture) and climatic suitability for wine production and its sensitivity to climate change. This research has involved the development of novel techniques in time-series vegetation remote sensing, object based image analysis and spatially explicit heat accumulation and vegetation phenological modelling using advanced GIS modelling techniques. Ecological responses to environmental watering events using remote sensing products. Hall, Horta (with PhD students and partners in NSW Office of Environment and Heritage) (2012 – ongoing) Monitoring ecological outcomes of environmental watering events are major research activities of ILWS. Spatial science has a large role within these projects, utilizing remotely sensed high resolution digital terrain models for hydrological modelling of wetland inundation connected with specific flow events and in-channel hydraulic modelling to ascertain effect on in-channel productivity and ecology, and remote sensing image analysis techniques for monitoring vegetation responses to wetland inundation. Spatial science techniques are a major component of the Murrumbidgee Long Term Intervention Monitoring Project, particularly in terms of modelling wetland hydrology with GIS analysis of LiDAR derived digital terrain models, broad-scale monitoring of vegetation response using spatiotemporal analysis of remote sensing data and habitat occupancy modelling. Spatial science and urban modelling. Whitsed, Davidson, Black (in cooperation with city councils) (2011-ongoing) Several urban modelling problems can be approached using spatial sciences. For example using aerial photography and satellite imagery together with GIS the researchers measured solar orientation in single dwelling houses of different ages, to measure whether energy efficiency is improving in line with building design regulations. Liveability is another key concept in urban modelling and can be analysed using socio-economic and environmental data such as neighbourhood characteristics and access to open space. Towards a space-time observation system for subsoil moisture content. Horta, A. (2013-2014). Richard Claude Mankin Postdoctoral Fellowship. Hall, A., Mathews, A. J., & Holzapfel, B. P. (2016). Potential effect of atmospheric warming on grapevine phenology and post-harvest heat accumulation across a range of climates. International Journal of Biometeorology, 1-18. Clarke, S., Lamont, K., Pan, H., Barry, L., Hall, A., & Rogiers, S. (2015). Spring root‐zone temperature regulates root growth, nutrient uptake and shoot growth dynamics in grapevines. Australian Journal of Grape and Wine Research, 21(3), 479-489.